October 30th was my last chemo. I was so excited it was like my birthday, Christmas morning, and Disneyland all rolled up in one. I was up at 4am, and giddy. Normally on chemo days, Mark would have to drag me to the car with tears flowing. On the last one I was strapped in, ready to go waiting for him… and I couldn’t wait. I got hooked up and visualized for the last time the final cancer cells exploding, vaporizing, and disappearing. Every single last cancer cell….GONE. I replaced that space with health, peace, and love. This has been such a long 4 months. I can remember how scared I was for the first treatment. That was the first time it was clear to me…”Oh crap, I have to do this…alone”. Mark had been by my side up until that point while we formed a plan…but getting chemo hooked up - in my arm only -was the official fork in the road for both of us. I went one way, and Mark watched in support. I felt the side effects and he tried hard to understand with compassion. With ups and downs, laughter and tears, this went on for months. I had to walk it, and I had to dig deep to do it alone. On the first round, ignorance is bliss. I had no idea what to expect. I strapped on my armor, checked and double checked to make sure I had everything and was ready to go…then I took one step forward and started down the dark tunnel solo. With every day that passed, the journey got more difficult and wearing. Eventually I trudged, knee deep in the mud and the muck…wading in the swamp. I started to lose my gear- my boots- my bearings…and most of all, I started to lose control. By the time 8 weeks passed, I knew way too much and could predict how terrible I’d feel from one hour to the next. It became a slog. It was heavy, tiring, wearing…and it didn’t let up. My body was waning, but my mind would quietly say from one moment to the next…”One foot in front of the other. Just keep walking”. There was no light in the tunnel and I couldn’t see a flicker of light on the other side. It was the loneliest, darkest place I have ever been. I lost more gear…got worn down, kicked around, and then bottomed out. Not only was my physical body fading, but my mental state was starting to go as well. When you physically don’t feel well and forget what it’s like to feel normal, it’s a slippery slope with your mind. As I continued to lose my footing in the dark, I reached a point where I didn’t have anything left to give… and I knew it. I had to surrender. I had to take my next steps purely out of trust that I would get through the next moment, hour, day…and that I would be okay. Out of no other choice, I had to fully commit and trust. One foot in front of the other. Fake it till you make it. Choose a good attitude and trust your mind will bring your body where you want it to go. Through time I learned, this never failed…my attitude would always eventually bring me there…to a place of optimism and strength. Even if it was a distant whisper…that was enough. It was a conscious choice, but I made up my mind to trust and lean into love, not fear. When I was really down and out, I had a thought that I couldn’t wrap my mind around. I was overcome with fear of cancer reoccurring after this journey. The highest likelihood of this happening for me is the first 2-3 years after I’m done with all of my treatments. The thought of me going through this again freezes me right in my tracks. I couldn’t shake this horrible thought so I had to work it out. I grabbed my kids’ markers and went crazy drawing all over our sliding glass door. I didn’t know what I was going to draw…I just knew I had to work through these thoughts visually. What came out was remarkable. I drew seeds at the bottom under the soil. The word “thoughts” were in the middle of these seeds. They were planted in fertilizer, watered, and given sunlight all with the word “gratitude”. I planted my thoughts deep in gratitude. A stalk grew from the seeds and the stalk was made out of the word “beliefs”. A huge bright sunflower was at the top of the stalk with the word “reality” in it. I then drew my face with eyes closed and had a flower coming out the top of my head. It then made sense to me…If I keep my thoughts rooted in gratitude… they will turn into my beliefs… which will turn into my reality. To overcome the thought of cancer coming back was serious mental work. I made a decision right then and there that I am cancer free, and will be for life. I made a decision that I will do this once, and I will do it well so I can transform this experience into something good for the world. I made a 1, 5, and 10 year plan for my life. I dug in and got detailed because life isn’t waiting around for anybody. I drew pictures of what I wanted to do in the near future…camp, swim in the ocean,enjoy the redwoods, climb in the mountains, get dirty with my family outside…and I threw in Tahiti too…why not?! I kept a running list of the things you all did over the past 4 months…if it interested me, I wrote it down under the title “When I’m back inthe world”. I celebrated the beautiful things you did, and your highlights became mine. I used to subconsciously go through life checking things off lists during the week. Starting on Monday and planning for Friday. Creating things to look forward to, and thinking that is when I’m really living. What I realized through this experience is every moment of every day is filled with those exciting moments that I thought only existed here, there or on the weekends. They’re just unplanned which makes them so much better! The simplest moments have become the most abundant for me now. I’ve realized that for years I have unknowingly walked past, stomped over, and brushed off the miracles that exist in every moment of every day. They are all around you….in every moment – every conversation – every decision. They simply hinge on your attitude, and how you choose to look at it. It’s all there for the taking – for your enjoyment and every time you complain and blaze through the blessings right in front of you, imagine what the heavens say… you’re complaining about the one thing you think you don’t have, while overlooking the hundreds of things that have fallen in your lap that you haven’t noticed. I now understand deeply that when you say thank you for what you’ve got – you genuinely realize really how much you have. This journey you are witnessing isn’t about breast cancer; it’s about overcoming unwanted adversity which we will all encounter at one point or another. People take a moment and try to imagine themselves in my shoes. They ask themselves what they would do if they had no choice but to look fear in the face. People pause, resonate, and wonder because they know deep down, sometimes distantly, they carry that same strength. I was given a life experience called ‘cancer’ to express the capabilities of what all of our spirits possess. The power of the human spirit is made of determination,strength, and perseverance… and this is what we all get to come to earth with. We all have this inside of us, but until pushed, you don’t realize the magnitude. By watching the capabilities in another, you realize that it’s a reflection of what you already have. I have felt a great responsibility through this journey. I knew early on that I was given an opportunity and if I didn’t transform it to good, it would be wasted. I felt that I had no choice, but to buck up and rise to the occasion….despite the fact that I didn’t want to. I kicked and screamed in the beginning resistant to what reality was…then I surrendered and went with the flow. Once that happened, the blessings flowed as well and life got so much sweeter. The last day of chemo was an absolute celebration. It was also the final time I had to wear a dry ice hat for 8 hours to save the last of my hair. Mark agreed to join in comradery and wear his own ice hat for the last half hour with me. I put it on him – burning my fingers from the dry ice as I strapped it down tight. I watched him catch his breath and then get nauseous while he did Lamaze breathing to get through the pain. It was strangely satisfying to see him in my world for a half hour. And then it hit me…after 4 months apart, our paths had rejoined after that long fork in the road. It was the best feeling to be reunited and joined back together again. We were counting down the minutes till we both could take off the caps while cheering and celebrating inside. We then went into the garage where the coolers were to take off the caps, and Mark opened the garage door. 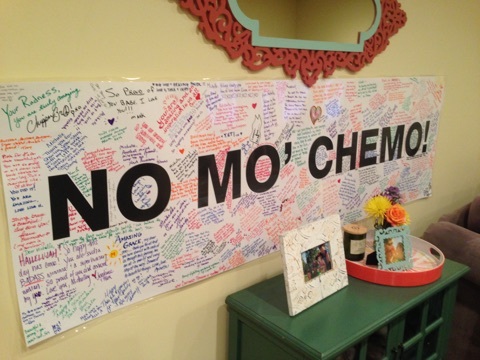 To my surprise, our driveway was filled with people in costumes, balloons, party hats, banging pots and pans and all cheering with a huge banner (signed by many) that read, “No Mo’ Chemo”. I was flooded with emotion as I both laughed and cried uncontrollably at the same time while pumping my arms in the air cheering. It was the most amazing feeling. It was the exclamation mark on this chapter that we finally got to close. My girls were right in front with their party hats on and balloons in hand … I looked at them beaming and knew I dug deep solely for them. I have never been more proud of myself. I have never been more proud of my family. And I have never been more proud to be part of Patagonia. My community carried us through with strength and support so I could walk through this tunnel with the least amount of harm to my girls… allowing them to simply be 2 and 4. For that, I am greatful beyond measure. The power of the human spirit is boundless. I can say today that I came out of that tunnel… shed all my armor and I’m in the light which feels so good. My world has expanded tenfold for the better. It was packaged in such a scary box that I didn’t want to peak inside…but as soon as I surrendered and opened it, the package has been filled with such beautiful gifts that will forever change how I look at life. I’m not going to waste one precious moment that I get on earth. I know what it’s like to walk the tightrope of life, leaning one way or the other and deeply feeling the possibility of it all being taken away. It’s so precious– and it’s such a gift. I am in holy territory now where everything is so beautiful to me. I can’t imagine stepping out of this light for one moment because it feels so good to be in this space. I walked through that tunnel and trusted when I was in the dark and didn’t know the way. I put one foot in front of the other, and I was carried beyond my own human capabilities. I’m proud to say that today, I thank cancer for changing my existence….for what was trying to kill me, actually gave me a deeper fullfilling life. Life is beautiful, and it’s yours for the taking and enjoyment…it simply hinges on how you choose to look at it.